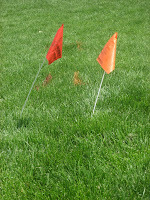 Our utilities were flagged this afternoon, in preparation for the patio. Just waiting for the call from Big Bad Dave. Nevermind Big Bad Dave... How about that grass? Green, thick, and weed-free!! Is everyone else using their Spectrum Brands products? ?